← Supporting Whistle-blowers: Where is the Peace Movement? 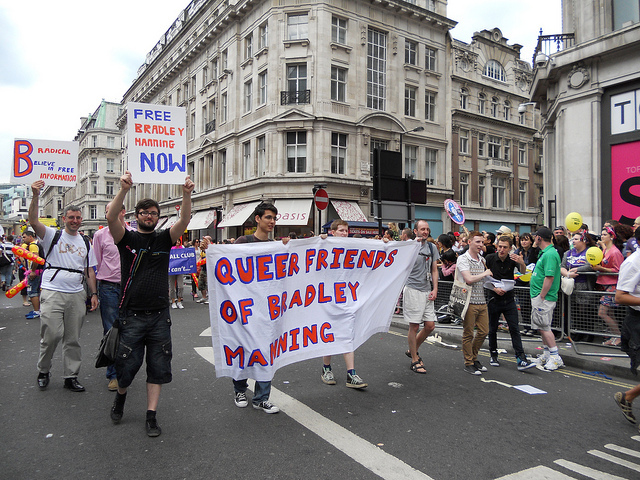 Bradley Manning’s situation was brought to the attention of folk at Pride London on Saturday 2 July by Queer Friends of Bradley Manning, who formed a walking group on the march with banners and placards they had made earlier. They were supported by UK Friends of Bradley Manning, who handed out hundreds of flyers. Supporters of Bradley Manning have also taken part in Pride events in San Fransisco, New York and Chicago recently. More photos here and a report coming soon, we hope.